If you've never blasted Cheap Trick's live version of "I Want You to Want Me" and sang along while blasting down the highway with the windows down on a sunny summer day, turn off your computer and do so immediately. If it's too cold where you are and you can't turn the windows down, take a road trip to a more temperate climate. It'll be fun. Go ahead, we'll wait. If you are one of the millions of people who have experienced the anthemic, joyous music of Cheap Trick in the context in which its meant to be heard (in a fast car with windows down and sunglasses on), you know that one of the most important ingredients to their sonic stew is Tom Petersson's melodic yet muscular bass playing. With a McCartney-esque sense of melody and a healthy dose of Enthwhistlian attitude, Petersson has laid down the low end for the princes of power pop for almost four decades. Now, our friends at Gretsch have honored him for being one of the foremost purveyors of the low end by giving him a signature Gretsch bass. 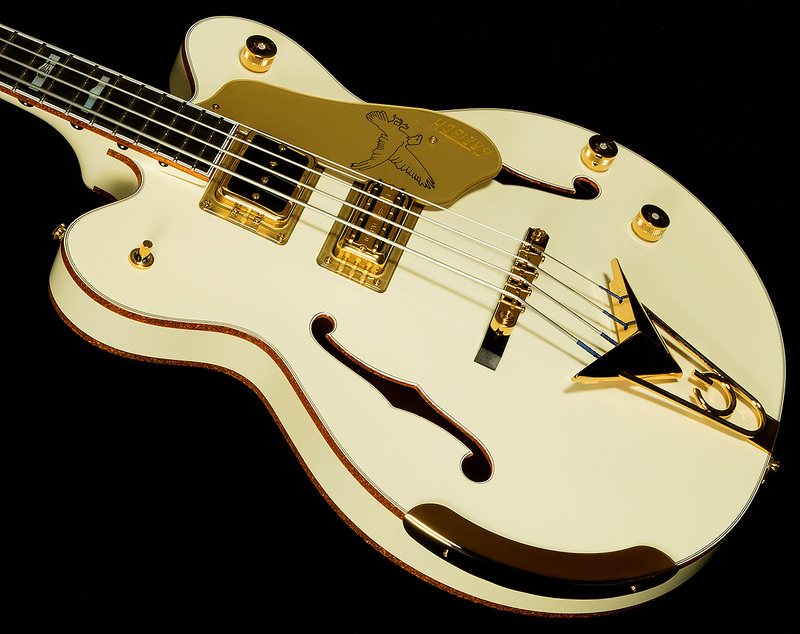 Without further adieu, Wildwoodians, allow us to present you with the Tom Petersson Signature 4-String Falcon bass. 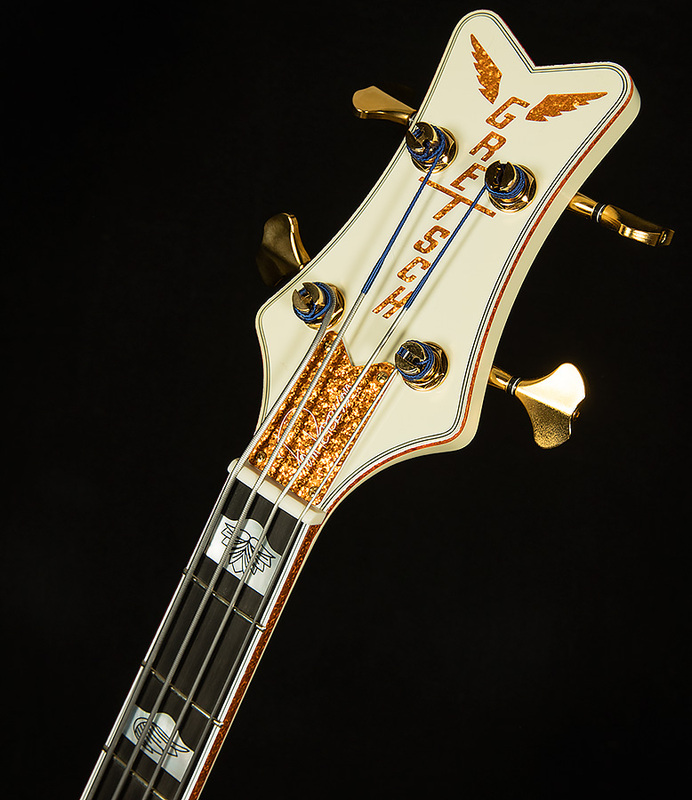 If the Dream Police got inside my head and found my mental list of favorite bass tones, they'd find the Tom Petersson Falcon Bass near the top. First off, its semi-hollow center-block construction gives it an upright-like sense of fullness and woodiness. But, because its body is made of laminated maple, it has a bit of extra snappiness, transparency, brightness and bite. Beyond that, its short scale length increases its punching power while also giving it a more percussive, upright-like attack. Such an excellent acoustic voice serves as a building block for greater things once you plug in. 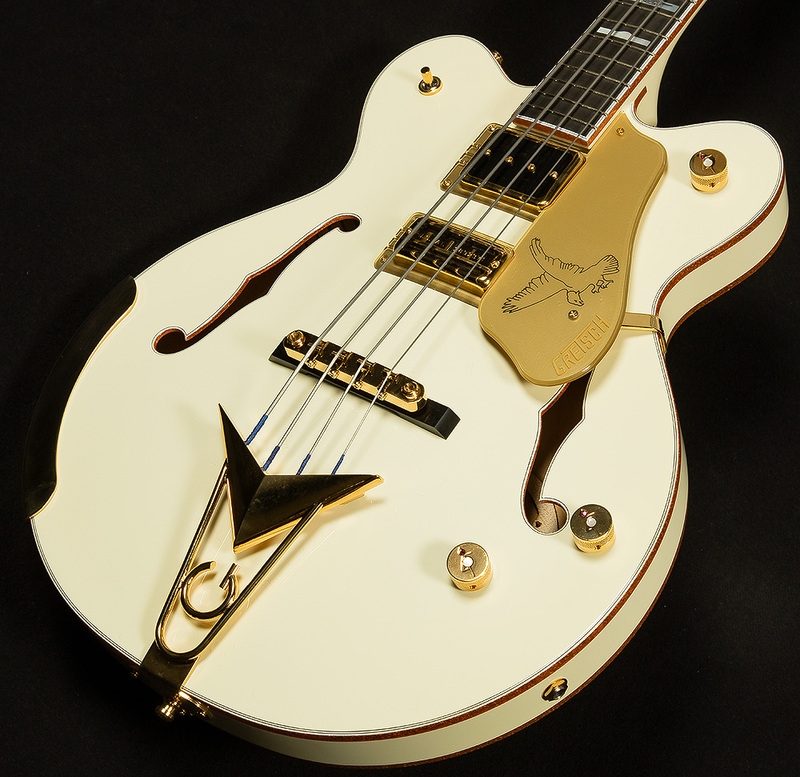 The Tom Petersson Signature Falcon Bass comes quipped with two spectacular pickups: a Gretsch Rumble'tron in the neck position and a custom Seymour Duncan Super'Tron in the bridge. The Rumble'tron is deep, warm, and round in the lows, transparent in the mids, and open in the highs. Though it sounds cavernous thanks to the large semi-hollow body, it still retains excellent clarity and note separation. On the other hand, the Super'Tron (based on Chet Atkins's favorite type of neck pickup) presents yet another delectable flavor. Its meaty highs, punchy mids, and tight lows are a perfect contrast to the warm, deep tones found in the neck position. However, the middle position is where a lot of the magic happens. Together, these two pickups produce balanced, full, rich tone across the whole frequency spectrum with enough bite to cut through a mix and enough depth to provide a rock-solid foundation for other musicians. All in all, the Tom Petersson Signature 4-String Falcon Bass sounds classic, but you can't compare its tone directly to any other basses, because nothing else really sounds like it! It's fresh and exciting, yet it's also timeless. But, this Falcon is more than just a sonorous songbird! Is there anything more majestic than a falcon drifting towards the sun on a thermal draft of air above a wooded glen on a spring day? Naturalists would say no, but I would say that the Gretsch Falcon bass competes favorably with any falcon found in the natural world. With its elegant aged white finish, regal gold hardware, gold sparkle binding, and ebony fretboard, this bass comes dressed to kill. Such a luxurious aesthetic makes sitting down to play feel like the musical equivalent of putting the key into the ignition of a '67 Cadillac Deville. Speaking of car metaphors, the Tom Petersson Signature Falcon Bass has one heck of a smooth ride. What makes this Cadillac of basses feel so righteous? Well, its short 30.3" scale length allows for closer fret spacing and decreases string tension, which makes it feel buttery and slinky in your hands. 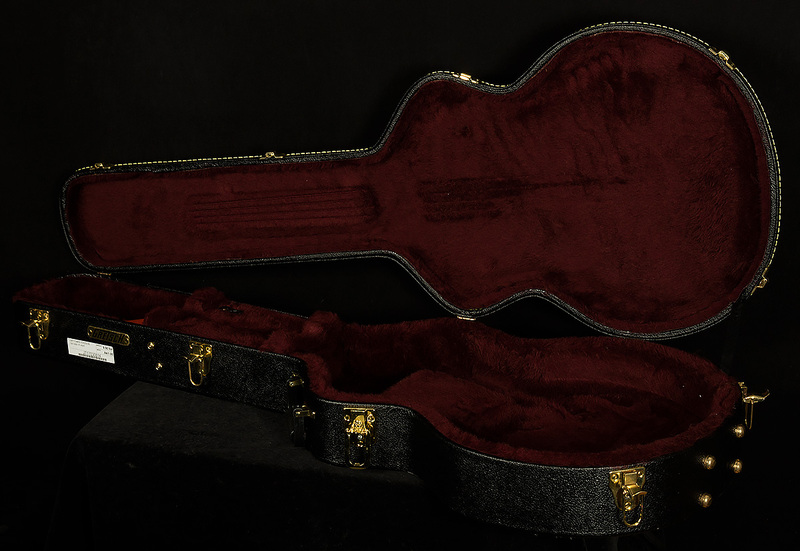 Also, the classic Gretsch U-shaped neck profile lends itself well to the more physical word of bass technique, because its wide center and pleasant slope allow you to gain maximum leverage. To summarize: the Tom Petersson Signature Falcon Bass looks fly, plays smooth, and is stuffed to the brim with inspiring sounds. We're proud to showcase such a high-flying thunder staff, and we know that, after one pluck of the low E, you will want to want it for the rest of your life.